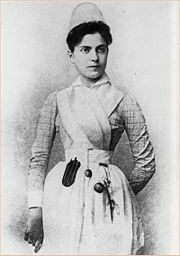 Young Lillian Wald in nursing uniform. Lillian D. Wald (March 10, 1867 – September 1, 1940) was an American nurse and social worker, active in the late nineteenth and early twentieth centuries. Wald helped to provide standardized health care to New York City’s Lower East Side tenements, and founded New York’s Henry Street Settlement House and the Visiting Nurse Service. She remained active in public health nursing and housing reform, and advocated on behalf of women’s suffrage, world peace, and the rights of women, children, and immigrants until her retirement from public service in 1933. A lifelong idealist, Wald believed in working to create a more just society by ensuring that women, children, immigrants, and the poor all received equal access to public health care. Lillian Wald was born on March 10, 1867 in Cincinnati, Ohio to a comfortable, German-Jewish middle-class family. She was the third of four children born to parents Max and Minnie Wald, both European immigrants. In 1878 the family relocated to Rochester, New York where Lillian enjoyed a happy and privileged childhood. She attended Miss Cruttenden's English-French Boarding and Day School for Young Ladies where she excelled in science, mathematics, and the arts. Upon graduation, at the age of 16, she attempted to enroll in Vassar College, but was denied due to her youth. In 1889, after assisting in the birth of her sister’s child, Lillian was inspired to embark on a career in nursing, eventually enrolling in the New York Hospital School of Nursing. Wald would never marry, preferring to devote herself fully to her career. In 1933, she suffered a stroke which put her into retirement from public service. She retreated to a home in Westport, Connecticut where she was repeatedly visited by such significant figures as Jane Addams, Eleanor Roosevelt, and Albert Einstein. On September 1, 1940, Lillian Wald died at the age of 73. After graduating from nursing school in 1891, Lillian Wald worked as a professional nurse at the New York Juvenile Asylum, an orphanage for children between the ages of five and 14. Shortly after, she enrolled at the Women’s Medical College of New York City for further training, and coined the term “public health nurse” in 1893 to describe a nurse who worked outside hospitals in poor and middle class communities. In 1899, Wald initiated a series of lectures to be held at Columbia University’s Teachers College to educate prospective public health nurses. This led to the formation of Columbia’s Department of Nursing and Public Health in 1910, and later to the establishment of the National Organization of Public Health Nurses (NOPHN), which set professional standards and techniques for visiting nurses. Wald would serve as the organization’s first president. After teaching a class in home nursing and hygiene to immigrant women of the Lower East Side, Wald decided to dedicate her life’s work to the tenement community. With funding from philanthropists and friends, Wald and colleague Mary Brewster founded the Visiting Nurses Service in 1893. In 1895, they established New York’s Henry Street Settlement House, one of several social settlements that were established in the United States inspired by the movement begun in Great Britain with the founding of Toynbee Hall by Samuel and Henrietta Barnett. Her deep concern for the needs of her Lower East Side neighbors inspired her to work on behalf of improving the living conditions of those around her. She also worked to transform the backyard of the Henry Street Settlement House into a playground, and would later help to found New York’s Outdoor Recreation League, which focused attention on the need for public parks and playgrounds throughout the city. Wald authored two books relating to this work, the first being The House on Henry Street (1915) followed by Windows on Henry Street (1934). In 1903, Wald worked with other reformers including Florence Kelley, who had been a resident at the Henry Street Settlement, in founding the Women’s Trade Union League (WTUL). This organization investigated working conditions for female workers in workplaces throughout the nation. The WTUL also promoted the formation of women’s trade unions. In later years, Wald became a member of the executive committee of the New York City League. Wald was also active in the National Child Labor Committee, which sought to abolish child labor, promote children’s health, and reclaim children who dropped out of school. In 1919, she represented the United States Children’s Bureau at a Red Cross conference in Cannes, France, later attending the second international conference on Women for Peace in Zurich, which founded the Women’s International League for Peace and Freedom. Following Wald's death, more than 2,500 mourners filled Carnegie Hall to hear words from President Franklin D. Roosevelt, the New York Governor, and the Mayor, all testifying to Wald’s ability to bring people together and effect change. Lillian Wald is widely acknowledged as the founder of visiting nursing in the United States and Canada. While working in New York City schools, Wald helped to provide adequate health and nutrition to all students, organized special education classes, installed the first public school nurses, and established the first public school lunch system in 1908. Today, Wald’s Henry Street Settlement continues to provide services to residents of the Lower East Side, and offers programs in 11 facilities including the Abrons Arts Center. Programs include art classes for children and adults, shelter services, health services, senior services, a workforce development center, day care centers, and after school and summer youth programs. Wald, Lillian. 1923. Children and Play. Areprint Service. Wald, Lillian. 1939. Windows on Henry Street. Little Brown and Co.
Wald, Lillian. 1943. The Relation of Personal Frames of Reference to Social Judgments. Archives of Psychology. Answers.com. 2006. Lillian Wald Biographies, Answers Corporation. Retrieved November 21, 2007. Jewish Women's Archive. JWA Lillian Wald Introduction Retrieved November 21, 2007. Women in the Progressive Era National Park Service. This page was last modified on 23 July 2018, at 14:06.